Research supports what all parents know. High-quality early childhood programs prepare children for school and lead to positive outcomes later in a child’s life; and high-quality after-school programs improve school attendance and student connectedness to school, increase academic achievement, and help children avoid risky behaviors. 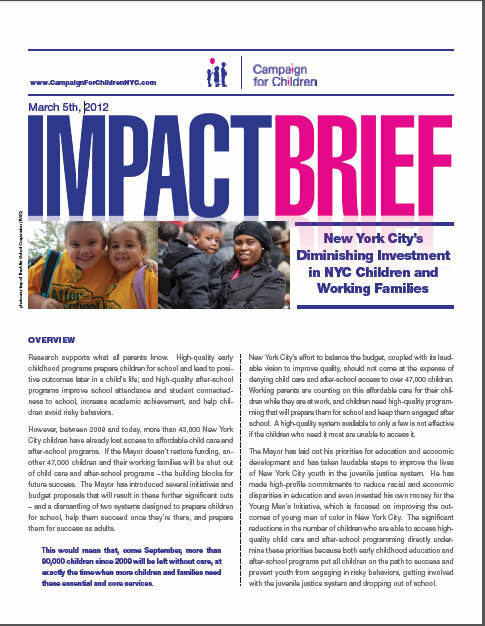 However, between 2009 and today, more than 43,000 New York City children have already lost access to affordable child care and after-school programs. If the Mayor doesn’t restore funding, another 47,000 children and their working families will be shut out of child care and after-school programs – the building blocks for future success. The Mayor has introduced several initiatives and budget proposals that will result in these further significant cuts – and a dismantling of two systems designed to prepare children for school, help them succeed once they’re there, and prepare them for success as adults. This would mean that, come September, more than 90,000 children since 2009 will be left without care, at exactly the time when more children and families need these essential and core services.